For general information on managing user permissions, please read our Admin user permissions article. Create health center visit logs: Permission to create new health center visit logs for enrolled campers. Medical read: Permission to read camper medical information. Medical reports: Permission to use the medical reports on the Medical dashboard to generate/print camper medical data in mass. 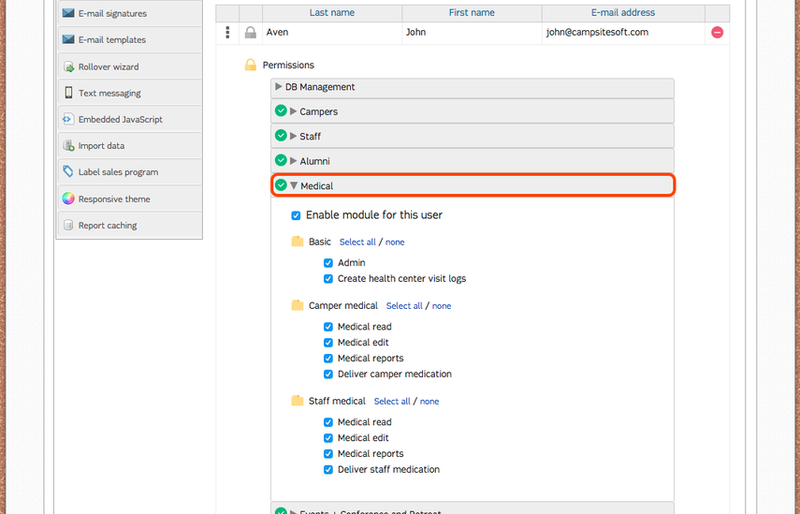 Deliver camper medication: Permission to use the medication delivery tool to deliver medications to campers. Medical read: Permission to read staff medical information. Medical reports: Permission to use the medical reports on the Medical dashboard to generate/print staff medical data in mass. Deliver staff medication: Permission to use the medication delivery tool to deliver medications to staff.